Vato Gonzalez hooks up with the UK’s grime artist Lethal Bizzle and hip hop protégé Donae’o on new single ‘Not A Saint’. 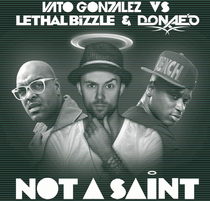 First surfacing as a remix, Vato Gonzalez’s rework of Lethal Bizzle & Donae’o – ‘Not A Saint’ grabbed attention so much that it’s now set for an official release. Gonzalez is no stranger to creating dancefloor bombs, since riding high in the charts last year with ‘Badman Riddim’ with fellow EDM star Foreign Beggars. He does it again with this single, which is already getting support from DJs including Radio 1 DJs Annie Nightinggale and Danny Howard, Capital FM’s Andi Durrant and Kiss FM’s Steve Smart among others. The original version’s heavy electro beats and dirty synth riff, combined with Lethal Bizzle’s #Dench bars plus Donaeo’s song make ‘Not A Saint’ a track that’s grown over the months. Remixes come with Max-NRG delivering two remixes in a D&B and drumstep style with high energy break beats and euphoric riffs, whilst Skitzofrenix serve up a bass heavy platter. JaXXon adds his own take on the big room progressive sound and Substantial Error go for no holds barred, bass-house-electro hybrid. It’s out January 6.